UCLA bound senior, Kazmeir Allen, wins the 100m at the state track and field meet running 10.44. During football season, Kazmeir set the national single season touchdown record with 72. 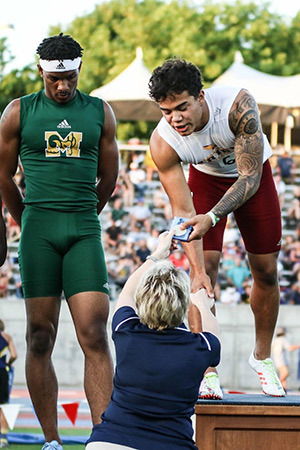 Now, he adds a state championship to his accomplishments making him the fastest high school student in California. We would like to congratulate sophomore, Jaci Maze, for her recent record-setting 10' 6" pole vault! Please take a moment to view Jaci's vault! All students planning to play a sport next year can get their physical taken care of this spring for only $10. It's a deal you can't beat! There are two dates that Tulare Union students can attend. See our sports physical flyer for more details. Fill out the physical pre-registration history form and take it with you to the physical. All athletes must have a physical before they can practice or even tryout, so make sure you get your physical this spring. All athletes must have a physical before they can practice with a school team. We require every student to have a physical dated within one year of participation. For example, a physical performed in May covers the student until the following May. Any athletes who plan to compete in a fall sport should get a physical in June or July to ensure readiness by the first day of practice. Please pick up a packet from the nurse’s office and complete and sign all the documents.Then, return the packet, including the physical form signed by the doctor, to the nurse who will issue you a green slip to show your coach you are cleared to practice.